Silicon Integrated Systems has launched a new internet HDTV system on chip (SoC) solution, supporting Android 2.2 Froyo OS and offering customized widgets, include popular services like Youtube, Facebook, eBay, Flickr, weather and google finance for life information, as well as online film renting. 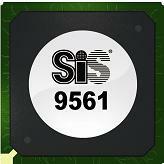 The SiS9561 HDTV SoC is aimed for Smart TV Market and integrates dual core 32-bit 576MHz MIPS processors, OpenGL ES1.1 graphic engine and supports DDR3-1333 memory subsystem. It supports all kinds of video formats including MPEG 1/2/4,RM/RMVB,H.264 and etc, as well Adobe Flash Player 10.1 application. The SiS9561 Android-based internet TV is a keyboard-free, users can switch the TV or Internet TV function by remote control in stead of a PC keyboard and also allowing users to use their Android smartphone or tablet to control SiS9561 Android TV. It supports USB and SD/MMC input devices to save the internet contents and users can also use embedded Skype internet communication on SiS9561 Android internet TV platform. Sample of SiS9561 SoC has been under customers’ verification now and SiS9561-based internet TV product are planed to be available at Q2.